I sit back, her kiss still fresh on my cheek, her laughter still echoing in the car, and watch my little girl climb the steps to the preschool at our local synagogue. In a month, I thought, she’ll be sleeping in her own new bed and making all new friends. No, she’s not five. She’s going off to college. Yesterday I dropped her off at her summer job, as a camp counselor with preschoolers. Before packing for work, she made her own breakfast. (Although she is a teenager who can make a full dinner for the family, my wife and I still made her breakfast until the day she graduated high school.) She was quiet on the ride to work after being out late with friends the night before. I was also a little tired. I had trouble falling back to sleep after I heard her get home from the party at 1:30am. I was recalling how I used to stay awake for her, listening for a change in her breathing on the baby monitor. Last night, though, I lied awake wrapped up in my feelings about how quiet the house will be in September when she goes off to school. There have been so many transitions (and there will be lots more). Each phase seems to give me a new opportunity to see the silver lining through the tears. I know that her leaving for college is a big step in how our relationship will evolve. She will become more independent and we will have more to talk about. I won’t be waiting up for her to come home or making her breakfast anymore. But cool stuff will start to replace those things. I will still be her father but I will also be growing along with her, welcoming her as another adult in the family. We all approach these changes differently. My friend once confided that her husband doesn’t ever talk about the task of parenting. She thinks he feels like he is doing it all wrong and is scared to ask questions that might open himself up to criticism and confirm that he is a bad parent. When she talks to her friends and mom, she talks about parenting. But she noticed that when her husband calls his parents, they talk about the kids. Dads are changing, though. In this generation, we are stepping up into the feelings-game more. 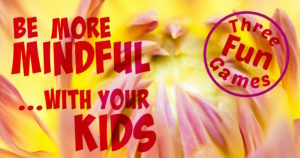 My friend Don Jackson, and his podcasting partner Chris Lewis, provide great resources for dads who want to parent differently. Don invited me to talk about transitions on their podcast and we really got into some deep revelations. It is pretty rare to hear two engaged fathers talking about parenting, not to mention two trained psychologists sharing their anxieties and feelings. 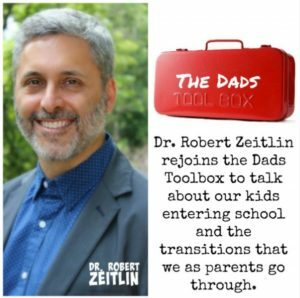 In this interview for The Dads Toolbox, Don allowed me to turn the tables on him. In my first podcast interview, I ask Don to share his feelings about his son starting school in the fall. Like Don and Chris, I have had the honor of meeting some outstanding fathers who are blazing trails in their communities as role models or leaders. As a three-time cancer survivor, Don started writing a blog to leave messages for his son in case he didn’t get to watch him grow up. I also met Christopher Persley and Nate Turner at the same conference for dad bloggers. Christopher is a stay-at-home dad who organizes and represents other fathers who make parenting a priority. Nate is an author and parent advocate who wants to change the way we educate all children and prepare them for a fast-changing future. Nate and I have become close friends traveling parallel roads to advocate for kids and parents. Recently I was honored when Nate invited me to write a forward to his book on education reform Stop the Bus! These dads are working hard to be engaged, empathetic, communicative fathers. Stay tuned for another Dad Spotlight podcast when Don gathers my whole family for a roundtable discussion to hear how going off to college affects our kids’ relationships with their parents and vice versa.